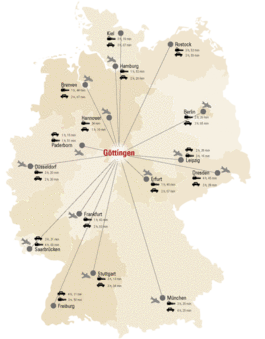 Located in the heart of Germany, Göttingen is “the city that spawns scientific achievement” (“Die Stadt, die Wissen schafft.”) Students dominate the urban landscape in the little big city of Göttingen. Why? Because Göttingen is home to four institutions of higher education, offering a wide range of options: from practice-orientated degree programmes at the universities of applied sciences and the vocational academy to application-oriented and research-oriented degree programmes at the globally networked university. Anyone strolling through the pedestrian zone in Göttingen will hear many languages spoken. Not only the tourists in the summer, but researchers, academics, teachers and students from around the globe give the cityscape an international flair all year round. Studying in Germany is popular; Göttingen has a good reputation and the town's atmosphere is quite cosy. 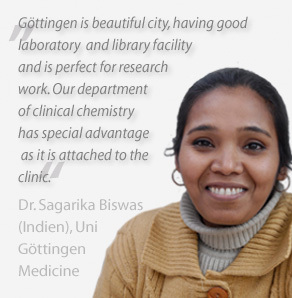 Around twelve percent of Göttingen university students have a foreign passport, not to mention guest lecturers and scholarship recipients taking advantage of their research visits to interact with the local scientific community: Internationality is the name of the game. The study curricula offered address the growing demand from abroad: One third of the university’s Master's degree programmes are taught in English; a growing number of programmes lead to a double degree with an internationally recognized partner university. Top-level research with international standards: The "Göttingen Campus" – a joint venture between the University, five Max Planck Institutes, the German Primate Centre, the German Centre for Aerospace and the Academy of Sciences – fosters a unique environment that has already laid the foundation for many a career. Close proximity to knowledge: Göttingen offers you the chance not only to meet in lecture halls and labs, but in pubs and cafés as well. The all-encompassing interconnectedness between everyday life and academia has been dubbed the "Göttingen spirit". But the city offers you even more than that: A wide array of university sports offerings and cultural events ranging from the Handel Festival to the traditional Christmas market ensure that Göttingen still has that oft-sought-after “Germany feeling”. A well-developed network of advisory and support services helps international students avoid disorientation in the first few weeks after their arrival. By providing student housing all throughout the metropolitan area and dining facilities for students of all institutions of higher education, the Studentenwerk provides for all the essentials: In Göttingen, you can eat and live very affordably.